My son will not learn to read and I am ok with that. He will not read this post, or any other post, not now and not in the future and I’m ok with that. He will not open his own Facebook account or Instagram account, not even Snapchat or whatever over social media platform might come next. He won’t and I’m just fine with that. He will not learn to read or write and yes he is blind, but no he will not learn braille either – and I’m ok with that. He will not go into the mall’s public restroom on his own and I have made peace with that as well. I am ok with what he is and love him for who he is just the way he is. At some point in this life journey, I have switched my perspective to a realistic one. I am no longer hoping for what might be, but focusing on what is. I need and want his goals to be realistic, attainable and functional for him – not for someone else, but for him at his age. I need his goals to be practical and functional for him and what he can achieve and become. I don’t need testing and questionnaires that will detail what he is not, I need only those that will show us what he is. And there is a lot that he is! He is a very happy smiley amazing fearless lovable young man. Someone who opened my heart to love I didn’t know even existed. Someone who has showed me what bravery is and showed me that love needs no words. I need the staff that work with him to be realistic and to acknowledge what is doable and possible. I need the staff to focus their energy on things he can achieve and not what he can’t and won’t. I prefer to be pleasantly surprised by his every achievement and not constantly disappointed of goals being presented – goals he can never reach. I need to hear the truth they and I all know. I need to be realistic. 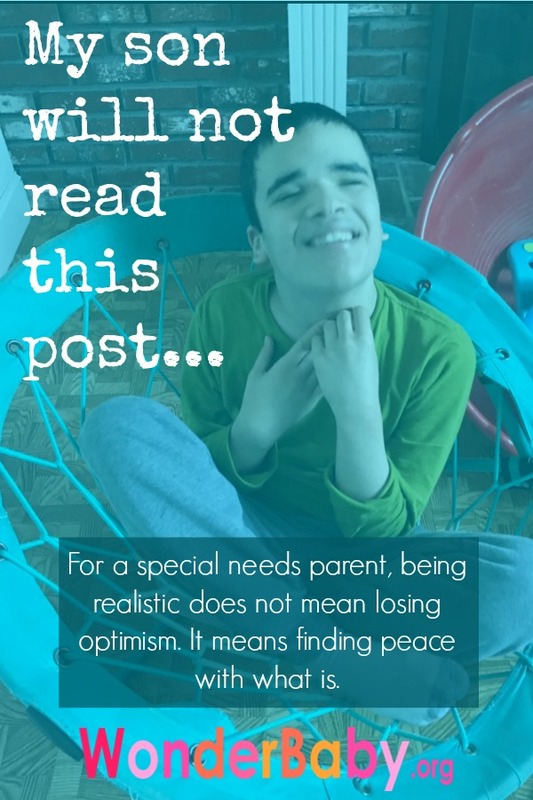 I need to stop hearing from others that I am undermining my son and his abilities because I can’t see the future and that I can never know what is possible. I don’t need to hear that for all we know, he might just learn how to read one day (he won’t) – I know enough, they know enough. I know he won’t read this post and I’m absolutely fine with that.